In this video series titled Call to Truth & Authentic Sikhism, I will read the entire book "Sikhism and Tantric Yoga" from cover to cover. Dr. Trilochan Singh's book is a rare and out of print manuscript by a Sikh scholar and historian which takes a critical look at Yogi Bhajan's kundalini and tantric yoga systems. I discovered this book during my two years in India. "Sikhism and Tantric Yoga" has been a real eye-opener for me and makes complete sense when I think about the last thirty years of my life with Yogi Bhajan. 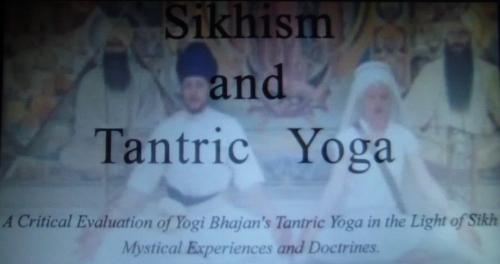 Written by the esteemed Dr. Trilochan Singh, author of over twenty books on Sikh history and philosophy and lecturer at sixteen Universities, "Sikhism and Tantric Yoga", describes the Sikh mystical path and is critical of Yogi Bhajan's Tantra and Kundalini Yoga. "The book Sikhism And Tantric Yoga is available at: www.gurmukhyoga.com.This website which is operated by a genuine Sikh is highly recommended. Gursant Singh was a member of the Yogi Bhajan Cult (3HO and the Sikhnet Gora Sikhs or White Sikhs) for over 30 years and has intimate knowledge about the inner workings of this cult which attempts to miscegnate Sikhism with Hindu idolatry. I downloaded the book from Gursant's website and found it to be absolutely compelling. I read it in one compulsive and sustained draught. It is a study not only about cults in Sikhism but about the miscegenation of the Sikh Religion by Hinduism. It is a classic work rendered in beautiful English prose and it is patently the work of a profound intellectual scholar with a deep knowledge of Sikhism."